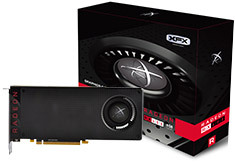 The XFX Radeon RX 480 Black OC features 1328MHz GPU clock, 8GB 256-bit GDDR5 memory, PCI-E 3.0, 2304 stream processors, XFX backplate, VR Ready, DirectX 12 support, OpenGL 4.5 support, AMD FreeSync technology, HDMI 2.0b, 3x DisplayPort 1.4 and more. The Polaris architecture precisely combines the latest 14nm FinFET process and AMD's advanced power, gating and clocking technologies for a superior cool and quiet gaming experience. Backed by a 3 year XFX warranty.